Abe's visit caps off a dizzying growth in bilateral ties, and heralds 'a new era' - what has been accomplished and what is on the docket? Japanese Prime Minister Shinzo Abe's historic three-day visit to Israel was ended hurriedly on Tuesday due to an Islamic State (ISIS) hostage crisis involving two Japanese nationals, but his visit highlights the meteoric developments in the Israeli-Japanese alliance that has been blossoming since Prime Minister Binyamin Netanyahu's visit to Japan last May. Just how have Israel and Japan gone from being average trade partners into full-blown allies, to the point where Netanyahu has said Israel is turning away from the West and towards Asia - and in particular towards Japan, owner of the world's third largest GDP and a global leader in technology? A brief look back at events since the May visit reveals numerous important developments that have received little limelight as the two nations have locked into a shared trajectory. Last June the Director of the Israel Space Agency made a first-ever visit to Japan, where he held important talks with Japan’s space-related ministries and agencies. Then a month later the Japanese Minister of Economy, Trade and Industry made his own first-ever trip to Israel, where the Israel-Japan Business Forum discussed joint investments in start-ups, hi-tech research and development (R&D) and cyber security. That visit also included the historic signing of a Memorandum of Cooperation in the fields of industrial R&D between the two nations. Significantly, it was the first such industrial R&D agreement that Japan had ever signed with another country. Blossoming ties continued to flourish last July, when the Japanese Minister for Internal Affairs and Communications made his first visit to Israel, during which he discussed shared socio-economic activities with his Israeli counterpart. Japanese Diet (parliament) members came to Israel last July as well, where they reaffirmed the desire for increased cooperation between Diet and Knesset members. That same month a follow-up memorandum on cooperating on industrial R&D was signed, solidifying the push for joint technological innovation. The Israeli Minister of Science visited Japan last October, where he and the Japanese Minister of Science and Technology vowed to advance cooperation in the vital field of science and technology. That same month, Japan's Deputy Foreign Minister came to Jerusalem for a Japan Culture Week where various aspects of Japan's traditional culture and modern society were introduced. The event was paralleled by Israeli cultural activities held across Japan. Israeli business leaders, headed by the Director General of the Prime Minister's office, visited Japan last November, where they discussed increasing R&D and cyber cooperation, and promoted mutual trade investment. In that same visit the Israeli and Japanese ministers of education discussed future cooperation in the field of education and youth exchange. Another historic breakthrough came last November when the first dialogue between Israel and Japan on the topic of cyber security was held in Tokyo. A month later in December the two countries were again discussing vital shared interests in Tokyo as part of the Eight Strategic Consultation. Officials from Japan's National Security Secretariat visited Israel in December, where they discussed their crucial field with senior officials of the Israeli National Security Council. And then earlier this month a Memorandum of Cooperation Concerning Scientific Cooperation between the two countries was signed, implementing a corroborative research program in the field of ICT. 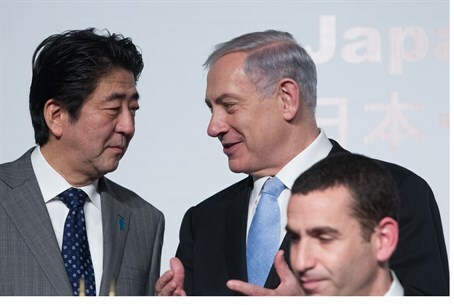 Also in early January a landmark plan, entitled the "Plan to Strengthen Economic Ties and Cooperation with Japan," was approved by the Israeli Cabinet, a move which Abe welcomed. The plan will see Israel expand ties with Japan in all fields, in a three-year project that represents an investment of millions of shekels and involves numerous governmental ministries. With such a rapid series of advancements in bilateral ties, where do the two countries go from here in further developing their alliance? During Abe's visit, both sides emphasized continuing efforts in the areas addressed up until now, and also urged cooperation in other areas, with Abe saying: "we look forward to further develop and advance our bilateral relationships, and we look forward to creating a new era for our relationship." Areas the two sides are focusing on significantly include promoting exchanges between the defense establishments of Japan and Israel, along with cooperating in the field of new energy and cyber security. Israel also intends to open a trade office in Osaka for the Kansai Region of Japan, in the western region of the main Honshu island from Kanto where Tokyo is located. The office will supplement the current Tokyo office and expand Israel's trade ties. A preparatory meeting is also to be held on launching negotiations for an investment agreement that will meaningfully increase financial connections between the two countries. The seventh Japan-Israel Science and Technology Joint Committee meeting, as well as the seventh economic joint working group meeting, are both to be held. Joint research grants awarded by Israel are also to be increased by a whopping 50% in 2015, and Israel is likewise to prepare for the planned visit of 500 young leaders from Japan in a program set to span three years. Both countries are to promote two-way tourism, and work to advance the topics of direct flights and arrangements for working holidays. Likewise, a new "Sport for Tomorrow" program to promote bilateral cooperation and exchanges in the field of sport is to be advanced. Abe's historical visit to Israel may be over, but from the look of things, a key strategic alliance between the two hi-tech powerhouses is just beginning.